Tropical Paradise - or Eel-infested Death Trap? 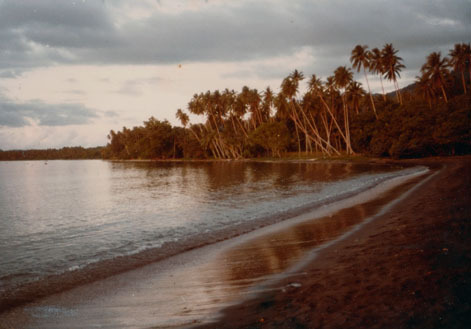 On a number of occasions during my youth our family holidayed in the Solomon Islands. We stayed in a small village I remember as Tambia (although Google has no idea the place exists in the Solomons; instead it points me to a resort in Fiji and let me tell you I KNOW we didn’t stay there!) -[EDIT: Conversation with my Mum tonight revealed that the actual spelling is Tambea – thanks Mum! ]- It was a simple place, in my memory it was an isolated oasis of small, thatch-roofed huts and other resort facilities nestled in beautiful tropical surrounds. The crystal clear waters of the Pacific Ocean rolled onto black sand beaches; days were filled with simple pleasures like canoeing, snorkelling or simply wandering those miraculous shores and the nights were spent with the caretakers and other residents of the village, the adults conversing and the children playing by the light of kerosene tiki torches and moonlight. In addition to being a tranquil playground, Tambia Village was also an educational wonderland. One particular lesson will stay with me for the rest of my life. My older brother is a hero of mine. He has taught me a great many important things about life and I don’t know where I would be without him. During one particular visit to the Solomons, he imparted his wisdom on me in a way I will never forget. He was always fond of demonstrating his superiority over me and as we wandered around the village we approached a small footbridge that crossed a river which was snaking its way toward the ocean. With his keen eye for opportunity, my brother stopped on the bridge and naturally I did the same. Looking over the rails he confidently informed me that he could lower himself from the bridge and then lift himself back onto it. Because he was awesome. Naturally, I was dubious. My brother was counting on it. So he proved it, sitting on the bridge at first and then, taking hold of one of the rails, he leaned forward and dipped down towards the water before lifting himself back onto the bridge and standing with a triumphant grin. As a determined younger brother, I was instantly compelled to prove to him that I could also complete this simple activity as well. The cautioning of my brother only reinforced my desire to show him that he wasn’t the only one who could perform this feat. After a brief review of the task, I sat on the bridge with my legs dangling over the side. I took hold of the rail and began lowering myself over and before I knew it I was hanging from the bridge, now reliant on the strength of my arms to return me to the safety of the solid wood planks. Within a second I realised that at my tender young age, I had not developed enough upper body strength to lift myself back onto the bridge! Had I been paying closer attention to my brother as he so haughtily demonstrated his physical prowess, maybe I would have noticed that his backside never actually left the edge of the bridge. By simple distraction he had succeeded in leaving me hanging from a bridge over a river! Now I wasn’t too upset at that stage. Having realised I’d been had, I was simply prepared to accept defeat, let go of the rail and drop into the water below. It wasn’t very far down – maybe half a metre from my feet to the water. I was a good swimmer and the river bank was quite close. Electric eels. In the river. That I was going to drop into because I couldn’t lift myself back onto the bridge. The terror sank in and shook me to my very core. Suddenly I weighed a million kilos and even though the surface of the river below me was unbroken, my brother continued to tell me about how the eels like to eat people and that they electrocute anything that touches the water. Tears began rolling down my face as I dangled precariously from the bridge, believing that at any second I would have a trillion volts of electricity pumped through my body before being eaten alive. Kicking and screaming I begged my brother to help get me down, and after a brief moment taken to savour another victory, he climbed down to the river bank, leaned out to the bridge and helped me shuffle to the edge of the bridge before dropping down onto the bank myself. Mumbling gratitude through tears and sniffling we made our way back to the village and I don’t remember another word ever being said about the whole affair. Upper body strength training should be on the kindergarten curriculum. If you could not find this place on google, it’s because you have spelt the name wrongly. Correct spelling is Tambea. Thanks Michael, I was spelling it incorrectly and was able to find it later when I checked with my family. 4.Brothers know just how far to push , but will be there to help if need be. OR don’t do that in the first place….typical boys…. Hahaha, that’s fair enough. But if we don’t push ourselves, it’s harder to get the most out of life! I’m glad to see, little brother, that you took away the important lessons I was trying to teach you during that exercise. And I’m heartened to see that you are choosing to pass these important lessons on. And thank you, brother, for helping me become a better person!